17, 18, 19 November 2014: winter!! This week features wool and cashmere and (unpictured) coats of awe, because it is so freaking cold. But but but! The most exciting thing of all is that I set up an eBay alert for the anthropologie Here and There tee with the Scotty dog and after months of nothing, there was one listed today! In my size! With a buy now option! So I totally bought right then and there and I cannot wait to wear my Scotty dog shirt yay!!! 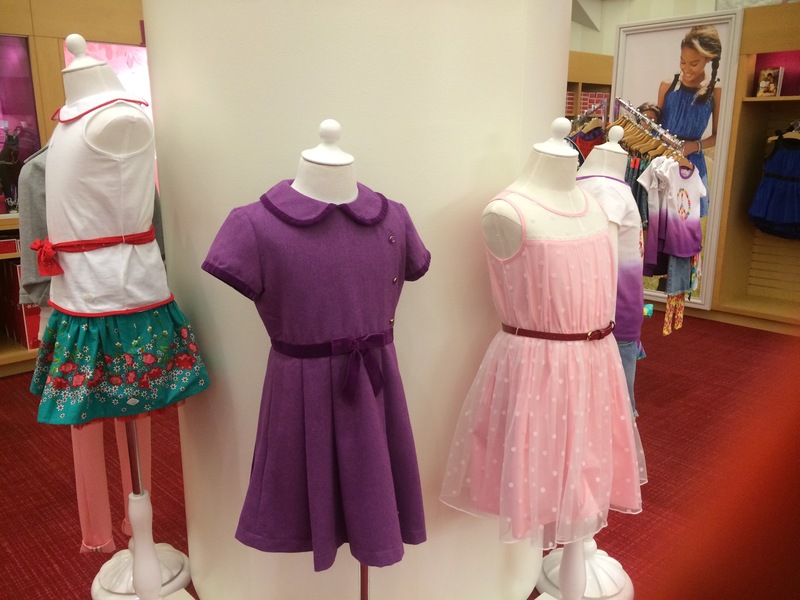 My coworker and I went downtown to the American Girl store to buy lots and lots of dolls and clothes to circulate at our library. I’m really glad that she insisted on driving, because my plan was to take the train and walk/cab like always, and, well. It was 11* outside. Instead, we parked in the indoor lot and shopped and had a yummy lunch and stayed nice and warm. It was so much fun, you guys. I have a lot of the AG dolls – I used to save my Christmas and birthday money as a kid and buy the dolls as they came out. But getting to buy all those clothes and hair doodads? I was in heaven. 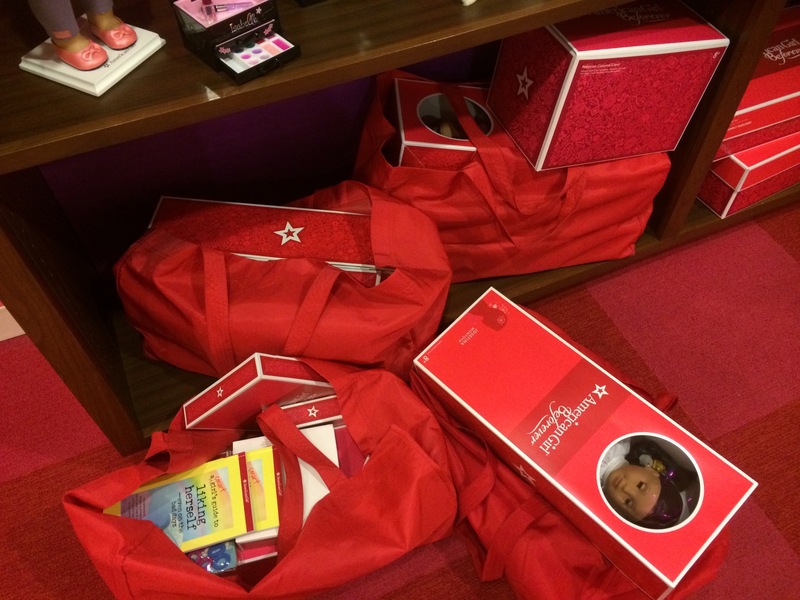 We even had a personal shopper and relaxed in the lounge while they rang everything up. Swoon. Negative degrees. In November! And yet, no snow. I won’t lie, I have a tiny bit of Buffalo (5-6′) envy. But at least I get to wear cute outfits like this. 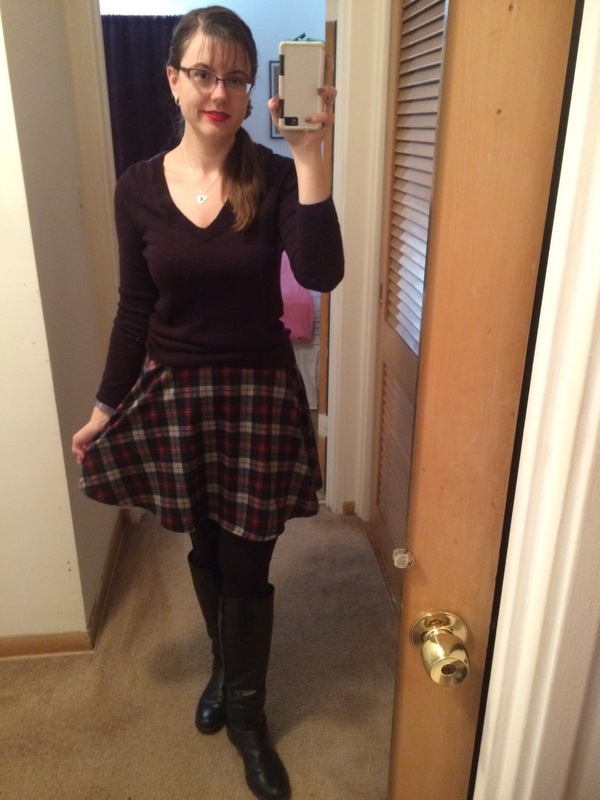 The skirt is new – it’s my first Ruche purchase and I am not super impressed. It’s thin, to the point where some of my cheaper Forever 21 skirts are better fabric quality. But I do love the print and I will always love a circle skirt. Also, this felt a little snug when I got it before my trip, and I was nervous, but it stayed comfortable all day. That was a relief. 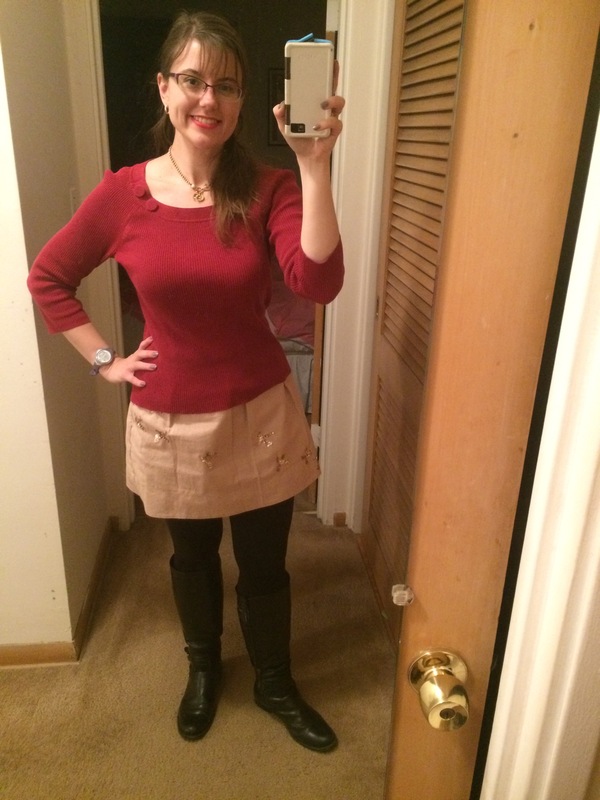 Though in retrospect, the purple sweater might not have totally gone with the cream/black/red/blue skirt. Hmm. 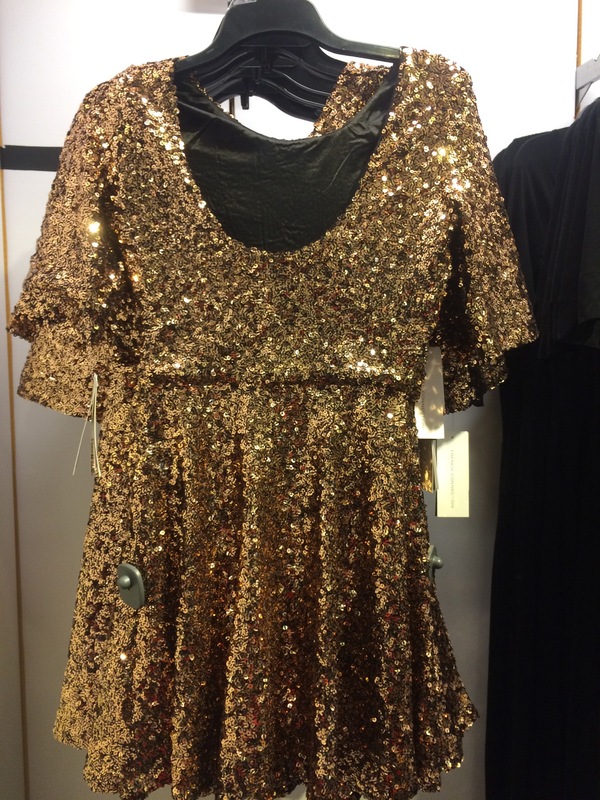 Sparkle! Gryffindor! Sometimes, you just need to be a sparkly Gryffindor. Also, if this miniskirt fits, I’m placing the tight jeans problem on the jeans and not me, which is nice. I got my boots back from the cobbler – the new heel is definitely a bit taller than the old one, and I should probably have the old one fixed, but I’m trying to figure out if I NEED to. Like, will it cause more pressure on one of the heels to be off balance? I think it’s okay, but maybe not. Yah! 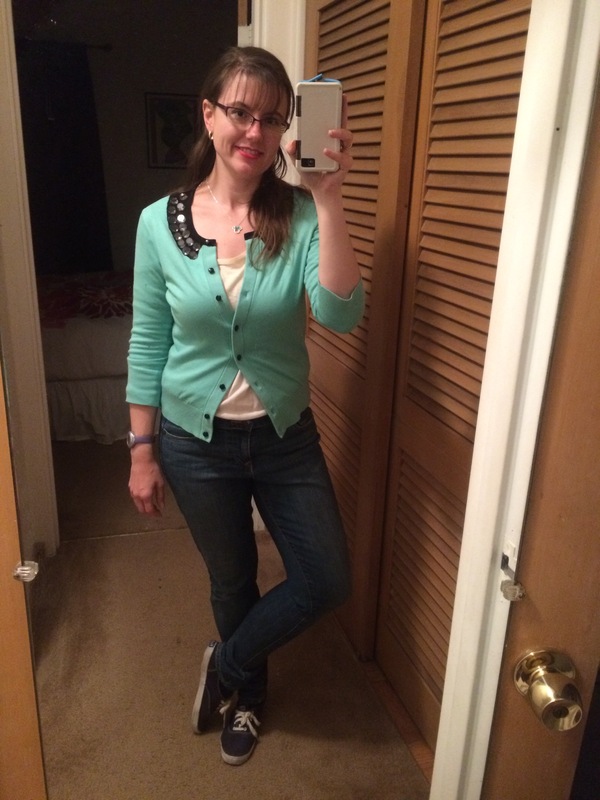 You’ve been having a good year hunting down your Anthro Ebay items! I vaguely recall the scotty dog tee. Hard to not love any kind of critter tee! Oh my gosh – The AG store! I bet that was so much fun! The kids at your library are gonna be over the moon! I know, I am so excited! It came last night, I can’t wait to wash and wear it. And you have NO IDEA, it was so awesome. And the freedom to buy something because I could? Unimaginable fun. I can’t wait to see the faces of the first kids who get to check them out!! I only wish the cataloging was ready so kids could have them over Thanksgiving break. Cute purple dress!! I like the pink one next to it as well. Jut an Idea, you should take the photo to a seamstress and see if she can make it for you. I agree, the pink is awesome – I love the illusion netting. And that’s a great idea, really. I’ll have to see how much something like that would run.